I LOVED this one, it's my favorite of the 4 installments! As usual we got our three POVs - Tony, Kate and Paul, but what made this one even better is getting to see more of two hilarious women - Sharada Bhar (Paul's mother) and Mrs. Snell (Tony's secretary). I do hope we'll get more of them in the next installment(s ?). Maybe because this one is shorter than the previous ones, it felt more fast paced and yet we got enough of twists and turns on who our killer is. There's a big change in this one, I was worried about how it would be and how it will influence the whole dynamics of the series, but I have a feeling it would only make it better in the next one(s ?). As Tony and Kate are dealing with Kate's family issues, they are thrown into a murder investigation close to home. An wealthy artist, living on Tony's street was brutally killed in his home and the guy who presumably did it while heavily liquored is not only at the scene he also called his girlfriend for help (after informing the police of the murder) and she is no other than Sharada Bhar - DS Deepal "Paul" Bhar's mother. These two, together or alone were killing me, I was Laughing Out Loud at their useless banter and Sharada turning up not a half bad detective! Naturally Paul is banned from the investigation but he has other issues to deal with - other family members as well as finally realizing what the "black dog" means.. It's not what he thought.. Tony had his own encounter with the dog - his reaction was PRICELESS. Yet don't think this means we get less of Paul because he isn't SUPPOSE to be a part of the team, he does his best under the radar, helping Kate, Tony and another surprising officer to solve the case. There's a lot going on in New Scotland yard. Which lead to us getting a different and a very enjoyable side of Mrs. Snell! (I loved her from the start so it was really a treat!) I won't say a thing more not to spoiler.. There is still too much unknown at this point.. but I have a feeling the one behind it all is known to us. I enjoyed getting another side to a character we learned to despise in the previous installments. I'm not sure if he redeemed himself entirely, but he does present a much better side of himself and he seems to be struggling to keep it up. Kate and Tony's relationship change and develop in this one due to the changes in their lives like Henry's mother wanting custody of her kid - the one Kate have been taking care of for years now. Henry and Richie both came to love and appreciate Tony, and naturally they have no reason to want to leave Kate who were their only family for most of their lives. Living with Tony only makes it better (Richie can watch "Lego World" any time he wants since he doesn't hog the ONLY TV at the house ;)). All in all a great installment, as I've said, the best one in my mind. I love the way the relationship between all characters have progressed throughout the books, and how much MORE we get about the supporting characters around them. 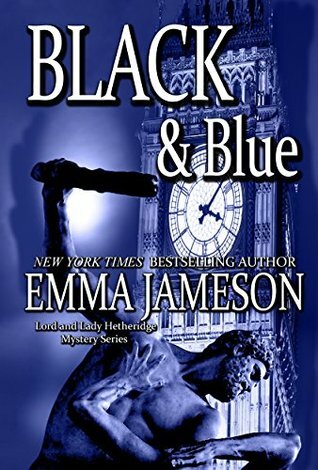 I know Emma is working on the 5th installment (which was suppose to be released already actually) but I do hope she'll keep writing more and more because this series is a fun reprieve from my usual go-to romance novels. Who would have thought I'd find myself reading mysteries? Like in many cases in which I veer from my usual reads it's always about a great author with fantastic writing who can make me read right about anything. So thanks Emma for being so great and making me step out of my comfort zone.